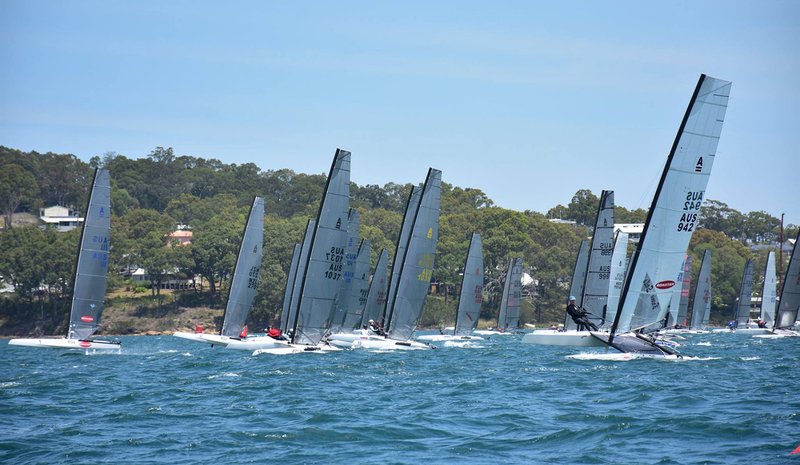 Photo from Day 1 by Wangi Amateur Sailing Club. - Another three more races held today in perfect conditions as reported by Gavin Rietman/Forward WIP Australia. Check later FW Aus Fb page to watch another nice video at the gate. No official or other images available. Glenn Ashby is getting in shape again after his Americas Cup dedicated sailing. Today 1,2 & 1 for him to grab the lead from Steve Brewin who sadly scored an ocs on the last race of the day, his other two scores were 3 & 1. Steve is 3pts behind but also has 5 bullets out of 9 races. Discarding a6th today would have leave him in the lead. Another sailor who is getting his A-Cat skills back is Nathan Outteridge: 2, 3 & 2 for climbing to 3rd overall. Brayshaw discarded his ocs and now sits 4th overall. All top four riders with Exploder D3. Brad Collet in 5th place is first Dna F1 of the fleet.